This year we will make a total of 25 predictions with five each week starting with this article. The predictions will range from conference winners to team win totals or bowl games to individual player performances. We will start with the mid-major conferences (predictions 25-16) before ending with the predictions for the Power 5 conferences (predictions 15-1). Below is the schedule for the 25 predictions. 25. Appalachian State will win the Sun Belt – We start with a team that has done very well since moving up from FCS to FBS. The Mountaineers went 4-8 in 2013 (their final FCS season), however, their three seasons in the FBS have resulted in winning records. 2014 saw them go 7-5, they went 11-2 in 2015, and went 10-3 in 2016. App State tied for the Sun Belt title last year with Arkansas State after both teams went 7-1 in conference. This year, the Mountaineers return 7 starters on both offense (scored 29.2 points per game) and defense (allowed 17.8 points per game). The real key is their schedule: no Arkansas State, no Troy, and no South Alabama. Their biggest test is at home versus Louisiana in the final week of season. 24. (Sun Belt) New Mexico State’s bowl drought will extend to 57 years – We made the same prediction last year and sure enough the Aggies did not disappoint going 3-9. There are some positives with 7 starters back on offense and 9 back on defense, which makes them the 12th most experienced team in the FBS. The real reason for putting this prediction here is the brutal schedule New Mexico State faces. In the non-conference slate, the Aggies play Arizona State, New Mexico, and Arkansas on the road and also take on UTEP at home. In the Sun Belt, NMSU has App State (away), Georgia Southern (away), Arkansas State (home), Louisiana (away), and South Alabama (home). If the Aggies manage to get to 6 wins, it will be a well deserved bowl appearance. 23. (C-USA) The four teams wearing green will not win 25 games combined – Here we have an out of the box prediction. The four teams that wear green are Marshall, Charlotte, North Texas, and UAB. UAB is back to playing football after a 2 year hiatus. The other three teams went a combined 12-25. So this is a slam dunk, right? Not so fast, though we are confident the four teams will not average over 6 wins per team. Marshall went 3-9 last year in their first losing season since 2010 when Doc Holliday was in his first season. The Herd are one of the favorites in the C-USA East division and could manage hit 10 wins in 2017. Charlotte is an intriguing team because they are in their third full season of FBS football. They went 2-10 and 4-8 the first two years while returning 6 starters on both offense and defense. A similar pattern of progression might move them close to the 6 win mark, but that will take a big improvement on defense (allowed 34.6 points and 453 yards per game). Over in the West division we have North Texas and UAB. North Texas went 5-8 last year and, thanks to an oversupply of bowl games, they were able to play a 13th game despite being 5-7. 2016 was the first year of Seth Littrell and year two has 6 starters back on offense and defense. The Mean Green could contend for a bowl game if they can pull a few in-conference upsets. For UAB, they have the uphill battle of assembling a competitive team. As one would expect, they have very few starters still around with only 4 returning and all of them on defense. Their most winnable games will be versus Alabama A&M, Ball State, and Coastal Carolina. Beyond that, with no competitive games in three years, it is tough to envision them getting close to 6 wins. 22. (C-USA) Both FAU and FIU will make a bowl game – The two Florida schools in C-USA welcome new coaches though both men have previous head coaching experience. Lane Kiffin is now leading Florida Atlantic while Florida International welcomes Butch Davis to the helm. What both teams have going for them is a bevy of returning starters. FAU has 9 starters back on offense and 8 back on defense. Despite returning their 2016 starting quarterback, the Owls have former Florida State player De’Andre Johnson. He should do well in the Kendal Briles system as should the rest of the offense. Defense is a bit more of question mark as they return 8 starters off a squad that allowed 39.8 points and 514 yards per game. Having a lot of starters back on a porous defense is not always a good thing. If they can improve 10 points and 100 yards per game then they have a decent chance of making a bowl game assuming the offense takes a big step forward in the new system. FIU has 7 starters back on offense and 8 on defense. All the skill players return on offense except for the #2 receiver, but there is more than enough depth to replace him. The defense has 8 starters back after allowing 34.8 points and 434 yards per game (5 starters back). They should improve on those numbers even with a new defensive coordinator. Both squads will probably need an upset to reach 6 wins, but both are more than capable of doing so. C-USA East looks very competitive, which means the potential for both teams to exceed (or miss) the expectations. 21. (Independent) Army will reach a second straight bowl game – Last year we liked Army to beat Navy and win at least 6 games. They did both as they defeated Navy for the first time in 15 years while finishing 8-5 with a bowl win over North Texas in the Heart of Dallas Bowl. 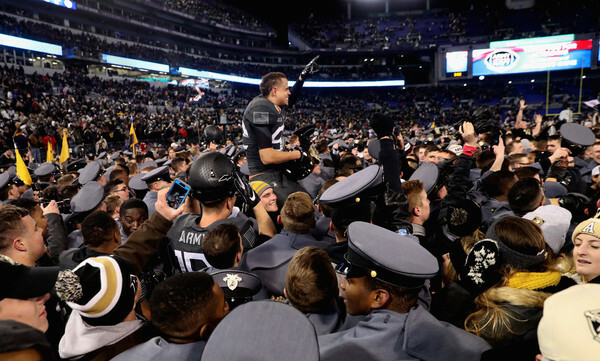 The schedule sets up pretty well again for Army to reach a second straight bowl. The open with Fordham and Buffalo before back-to-back road games at Ohio State and Tulane. Their next four games are versus UTEP, Rice, Eastern Michigan, and Temple with only the Rice contest taking place on the road. The first 8 games will take place without a bye week. The final four games will be completed over 6 weeks starting with a road game at Air Force on November 4. Duke goes to West Point the following week before another road game at North Texas. The final game is, of course, the annual title versus Navy on December. What really helps Army this year is the plethora of returning starters with 9 on offense and 7 on defense. The offense put up 29.9 points and 414 yards per game with the points being the most since 1996. The defense allowed 19.8 points and 291 yards per game and part of that was due to the easier schedule. However, the confidence should be high on both sides of the ball in their fourth year under Jeff Monken. With the combination of experience and a manageable schedule, Army looks poised to reach a second straight bowl game. That would mark only the second time in school history that Army reached back-to-back bowl games (1984-85). That concludes the first five predictions for the 2017 college football season. Check back next week for predictions 20-16. We have now entered the final full month of regular season action the 2016 college football season. Week 10 offers us #8 Wisconsin at Northwestern, #22 Oklahoma State at Kansas State, TCU at #13 Baylor, #10 Florida at Arkansas, Iowa at #20 Penn State, and the two biggest games on Saturday night: #1 Alabama at #15 LSU and #9 Nebraska at #6 Ohio State. 1. Louisville at Boston College (11/5 at 12 PM) – Ever since Louisville lost at Clemson they have not looked like the same team. They struggled against Duke at home, took care of NC State at home, but then struggled at Virginia. They needed a late touchdown to defeat the Cavaliers on the road and now they go to Chestnut Hill to face Boston College. The Eagles sit at 4-4 overall and still have a solid chance at making a bowl game even with a loss. However, they can give Louisville fits if their defense is playing at their very best. This game is bigger for Louisville because they have struggled since the loss at Clemson. They still have an outside shot of making the College Football Playoff, but how will the Committee view them if they continue to squeak by teams? A big win would help Louisville here. 2. Air Force at Army (11/5 at 12 PM) – The Commander-In-Chief’s Trophy is at stake in this game for Air Force. Both teams are 5-3 and win puts Air Force in a bowl while Army would still need another victory due to their schedule containing two FCS schools. Air Force started 4-0 including a 28-14 win at home against Navy. They then lost the next three games before needing a rally against Fresno State to reach 5-3. Army started 3-0 before back-to-back close losses to Buffalo and Duke on the road. They crushed Lafayette before North Texas soundly defeated the Black Knights. Army was able to get a big win last week against Wake Forest on the road to reach 5-3. Army can also win the CIC Trophy by defeating Air Force this week and Navy to end the regular reason. This will be a fun game to watch the old school triple option offense from both teams. 3. Georgia Southern at Ole Miss (11/5 at 12 PM) – No conference implications here, but there are bowl implications for both teams. Georgia Southern is 4-4 overall with their final three games consisting of Louisiana-Lafayette, Georgia State (away), and Troy. They will probably be favored in two of those games and a bowl game still looks likely even with a loss here. 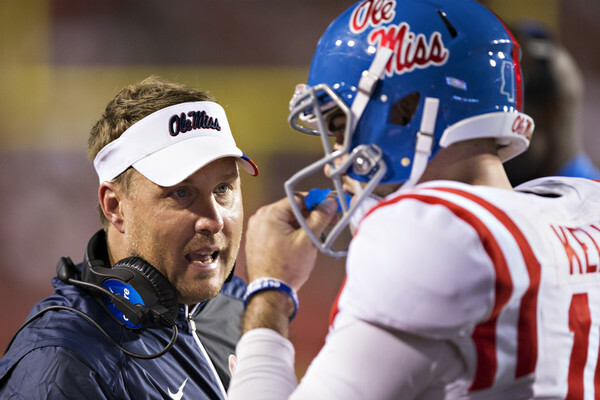 The same cannot be said for Ole Miss and they must treat every game as a must win. They are currently 3-5 with Texas A&M (away), Vanderbilt (away), and Mississippi State after this game. They can lose only one game the rest of the way and still make a bowl. Given their schedule (read as: Texas A&M), this is not the one to drop. 4. Texas at Texas Tech (11/5 at 12 PM) – Neither of these squads will be winning the Big 12, but the bowl implications are huge. Both teams sit at 4-4 overall and their schedules to end the season require little margin for error. Texas will face West Virginia, Kansas (away), and TCU after this contest. Texas Tech will play Oklahoma State (away), Iowa State (away), and Baylor. Now we can see why the winner of this game will be in much better position to make a bowl. Looking beyond this game and season, could either or both coaches be fired if they fail to make a bowl game? Some outlets already have marked Charlie Strong as a lame duck. What about Kliff Kingsbury? That would make it two of four years that Texas Tech did not reach a bowl under Kingsbury, assuming they do not win two of their final four games in 2016. He probably will not be fired if the Red Raiders fail to make a bowl game, but his seat will undoubtedly be warmer. 5. Pittsburgh at Miami (FL) (11/5 at 12:30 PM) – What a difference a month makes for both teams. Pittsburgh was 2-2 going into October, but have come out ahead with a 3-1 record last month to make them 5-3. Miami was 3-0 after September and it was 4-0 after defeating Georgia Tech, but it has been all downhill since. The Canes have lost four in a row with three games determined by a touchdown or less. Miami has a forgiving schedule the final month with games against Pitt, Virginia (away), NC State (away), and Duke, but nothing can be taken for granted with the slide they are currently on. Pittsburgh has Miami (away), Clemson (away), Duke, and Syracuse to end the season. Both teams look likely to make a bowl game based on the schedules, but this game will be worth watching to see how they respond to losses last week. 6. UT-San Antonio at Middle Tennessee (11/5 at 2:30 PM) – Both teams are alive in their respective Division races in Conference USA. UTSA is 3-2 in the West and sit a game out of first place. Middle Tennessee is 3-1 in the East and are a half-game behind Western Kentucky in the win column, but the Hilltoppers own the head-to-head victory. A loss for either team will probably end their hopes of making the Conference USA Championship Game. Middle Tennessee faces Marshall (away), Charlotte (away), and Florida Atlantic to end the season. They will probably be favored in all three of those, but would still need a loss or two from Western Kentucky to make the Championship Game. UTSA faces Louisiana Tech (away), Texas A&M (away), and Charlotte to end the season. A loss here and they would be 4-5, out of the West Division race, and facing the real possibility of missing a bowl game. The Roadrunners are also 1-2 on the road this year. Their win was over lowly Rice by a score of 14-13. This game is very big for the Roadrunners. 7. Hawaii at San Diego State (11/5 at 7 PM) – San Diego State can put a hammerlock on the West Division of the Mountain West with a win. The Aztecs sit 4-0 in conference while Hawaii is 3-2. Hawaii is currently the only other team in the West Division that has not lost at least 3 conference games. The Aztecs are also still in the race for the Group of 5 bid to one of the New Year’s Six Bowls. They need some help with Western Michigan still undefeated as well as Boise State having only one loss. Those two may also face in the Mountain West Championship Game. As for Hawaii, they are currently 4-5 overall and will need to reach 7 wins to make a bowl game. They wrap up with Boise State, Fresno State (away), and Massachusetts. This is basically a must win game for Hawaii to reach those 7 wins. 8. Georgia at Kentucky (11/5 at 7:30 PM) – This is weird to fathom, but Kentucky is currently the second placed team in the SEC East and also have a better overall record (5-3) than Georgia (4-4). Georgia really has not looked good since their opening win against North Carolina. They struggled against Nicholls State and Missouri to reach 3-0, but are just 1-4 their last five games including devastating late game losses to Tennessee and Vanderbilt at home. Kentucky started 2-3 this year, but have reeled off three straight wins to reach 5-3. Kentucky has not finished ahead of Georgia in the SEC East since 2006 when both teams finished 4-4 in the SEC and Kentucky defeated the Bulldogs that year. With a win Kentucky will be in a bowl, but probably would make one even with a loss against Georgia. They face Tennessee (away), Austin Peay, and Louisville (away). For Georgia, they face Auburn, UL-Lafayette, and Georgia Tech all at home to end the season. A loss is not crushing for the Bulldogs, but it will make things far easier for this inconsistent and underachieving team. Check back next week for the week 11 edition of Under The Radar Games. In addition, you can find the previous columns below. The 2016 College Football season is right around the corner and that means it is time for predictions. Below, five predictions will be made for the FBS Independents for the 2016 season. Some predictions will be right, some predictions will be wrong, and some will be spectacularly awful by the end of the season. The FBS Independents have a new team joining the fray as Army, BYU, and Notre Dame welcome Massachusetts. UMass was part of the MAC, but has not find a suitable landing spot yet. 1. Army will beat Navy in 2016 – This would be huge for Army as Navy has won 14 straight in one college football’s greatest rivalries. Army has lost by 7 points or less in four of the last five years and now return 16 starters. Navy returns just 8 starters with only one of those on offense while also losing the incredible Keenan Reynolds. A lot of factors point in Army’s favor to end the 14 year losing streak. 2. Army will reach 6 wins in 2016 – The Black Knights have not been to a bowl game since 2010 when they beat SMU 16-14 in the Armed Forces Bowl. This year they have winnable games against UTEP, Buffalo, Lafayette, North Texas, Wake Forest, and Morgan State. They also face Temple, Rice, Duke, Air Force, Notre Dame, and Navy. They could conceivably beat Rice or Navy, but that is a daunting task to defeat more than one of those (preferably Navy as seen above). Still, there is plenty to like about this team returning 16 starters and having an easy schedule to reach 6 wins. 3. UMass will not top 3 wins in 2016 – Last year the Minutemen went 3-9 with 19 starters back. While the offense was solid again, the defense improved only marginally and now only five starters return to that unit. In addition, the schedule looks tough for UMass as they face three SEC squads in Florida, Mississippi State, and South Carolina. They have winnable games against Old Dominion and Wagner plus they face Tulane and FIU. They will need to win all four of those games to prove this one wrong. 4. BYU will pull at least 3 upsets in the regular season – This prediction is based solely on the killer schedule the Cougars are facing: Arizona (neutral), at Utah, UCLA, West Virginia (neutral), Toledo, at Michigan St, Mississippi State, at Boise State, at Cincinnati, Southern Utah, Massachusetts, and Utah State. Of the 12 teams on their schedule, only Massachusetts did not play in the postseason as FCS Southern Utah played in the FCS Playoffs (lost to Sam Houston State in the first round). BYU does have the Taysom Hill and Jamaal Williams combination in the backfield as well as 8 starters back on defense. It is hard to think that BYU will not be able to win at least three games in which they are not favored. 5. Notre Dame will lose at least 3 regular season games – The Irish had an excellent 2015 season going 10-3 despite the early season loss of Malik Zaire. DeShone Kizer did well in his absence as both players return. The real problem is the amount of talent they lost on the line and at receiver. Replacing Will Fuller will not be easy though having Torii Hunter and Corey Robinson waiting will certainly help somewhat. The defense returns 5 starters but not the talented Jaylon Smith and also miss two starters at linebacker. The Irish have to face Texas (away) Michigan State (home), Stanford (home), Miami (FL), Virginia Tech (home), and USC (away). Three losses could be conceivable though there is plenty of talent on the Notre Dame roster. Check back soon for five predictions for the Sun Belt Conference in 2016. Below are the predictions completed and which conference is next. We have reached the ninth and final single digit in this 2015 College Football Preview with the FBS Independents. Also part of this release is the Sun Belt Preview, which can be found here. Below is a schedule of all the previews from those already published to those in the future. Let’s take a look at the three teams that comprise the FBS Independents. Brian Kelly led Notre Dame to through their fantastic 2012 season, which culminated in a crushing 42-14 loss in the National Championship. Outside of that 12-1 season, Kelly has not won more than nine games, nor lost less than four. The pressure may be on Kelly to get the Irish back into the national spotlight. 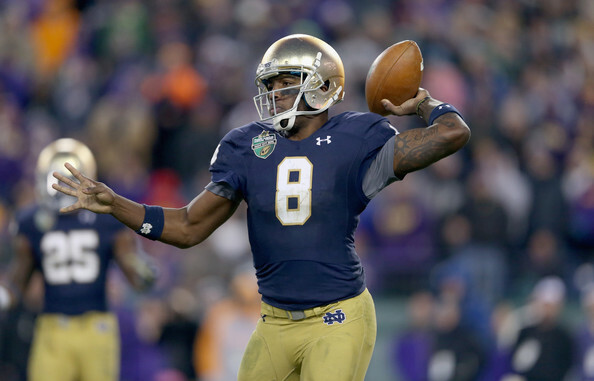 The offense returns seven starters, but one of them is not quarterback Everett Golson. Malik Zaire will be at the helm after a very nice starting performance in the Music City Bowl against LSU, finishing the season with 266 yards and a touchdown in only seven appearances. He will have both Tarean Folston (889 yards and 6 touchdowns) and Greg Bryant (289 yards and 3 touchdowns) in the backfield again this season. More importantly for Zaire is that he will have the top four receivers from 2014 back led by Will Fuller. Fuller had 76 catches for 1,094 yards and 15 touchdowns while easily becoming the most productive receiver last season. The Irish put up 32.8 points and 445 yards of offense per game in 2014 and if Zaire protects the ball better than Golson, they will do even better this year. The defense had its worst season in 2014 under Kelly. With four starters back, the gave up 29.2 points and 404 yards per game. The defense in 2015 will have 10 starters back and the one replacement is KeiVarae Russell, who was a starter in 2012 and 2013. The defensive line starters all had at least 39 tackles and a sack in 2014. The linebackers are led by Jaylon Smith. Smith had 112 tackles, 3.5 sacks, and 5.5 tackles for loss on his way to 2nd Team All-American accolades. The secondary has three starters back as well as the aforementioned Russell. The defense will be much better in 2015 and makes the Irish a serious threat to reach the College Football Playoffs. Notre Dame has several tough games in 2015. They open with a home game against Texas, but also face Georgia Tech (home) and Clemson (road) in the first five weeks. USC will travel to South Bend on October 17 as well, but the final five games of the Irish schedule look manageable. It looks very possible that Notre Dame will be back near the top of the national rankings again this year. BYU went from the Mountain West in 2010 to independent status in 2011. It looked like the right move as they went 10-3 in 2011, but have subsequently had three straight 8-5 seasons. 2014 started off great for BYU until the injury to star quarterback Taysom Hill. What will 2015 have in store for the Cougars? The offense has eight starters back including quarterback Taysom Hill. Hill was have an excellent year in 2014, but his injury forced Christian Stewart into action. Stewart did well in place of Hill by throwing for 2,621 yards with 25 touchdowns and 9 interceptions. The running game was not as strong with Jamaal Williams leading the team with 518 yards and 4 touchdowns while also having injury issues throughout the seasons. Mitch Mathews is also back after grabbing 73 passes for 922 yards and 9 touchdowns. Despite the injuries, BYU still managed to put up 37.1 points and 460 yards of offense in 2014. 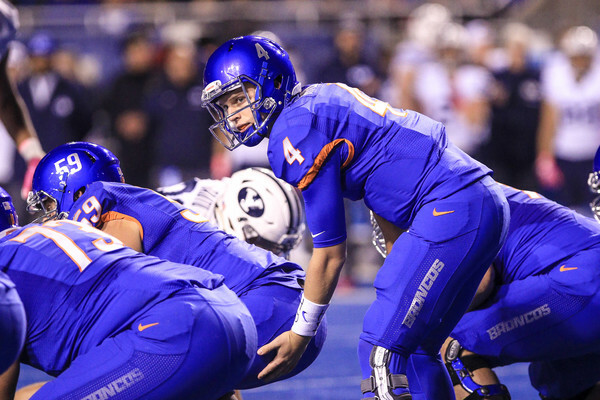 Now that Hill is back for 2015, the BYU offense could go even higher. The defense has only five returning starters and three of those reside on the defensive line. The line allowed only 122 rushing yards per game and only 3.3 yards per carry. The lone returning linebacker is Manoa Pikula and he finished 2014 with 49 tackles, 2 tackles for loss, and an interception. In the secondary, only Michael Davis is back after having 43 tackles and 6 pass breakups last season. The back eight have a lot of inexperience so the Cougars may be playing in quite a few shootouts this year. 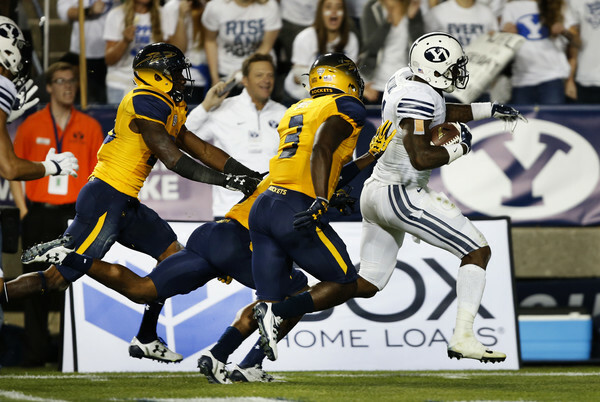 BYU has a tough schedule in 2015 as they open with three road games in the first four weeks. They face Nebraska (road), Boise State (home), UCLA (road), and Michigan (road). The middle portion of their schedule is a bit easier with games versus Connecticut, East Carolina, Cincinnati, and Wagner with all of those at home. After a bye week, they will face San Jose State (road), Missouri (Kansas City), Fresno State (home), and Utah State (road). It will be tough for BYU to reach double digits in the win column for 2015 even with Taysom Hill back. Jeff Monken took over Army in the offseason prior to 2014 and managed a 4-8 record with 14 starters back. This offseason, Army rebranded itself as Army West Point, but we will still refer to them as just Army. Will the second year of Monken and a new name help Army back to a bowl game? The offense returns only five starters. Quarterback will be a battle between the oft-injured AJ Schurr and Matthew Kaufmann. Schurr is likely to get the job if he is healthy considering he had 320 yards rushing and 3 touchdowns in addition to his 242 yards passing with a touchdown and interception. The running game has been hit hard by the loss of Larry Dixon (1,102 yards and 9 touchdowns) with Aaron Kemper (158 yards and a touchdown) and Matt Giachinta (152 yards and a touchdown) the top returning rushers behind Schurr. Edgar Poe had 10 catches for 199 yards and a touchdown in 2014, but the passing game is not the focal point of this offense. There are three starters back on the line as well as others who have seen time at multiple positions. The offense put up 24.9 points and 359 yards of offense in 2014 and could produce similar numbers this year as well. The defense also has only five starters returning. The defensive line has been raided by losses with no starters returning after they surrendered 193 rushing yards per game last year. Linebacker is strong with two starters returning led by Jeremy Timpf. He had 117 tackles, 1 sack, 13.5 tackles for loss, and three interceptions. He will be joined by Andrew King (63 tackles, 5 sacks, 3 tackles for loss). The secondary has three starters back including former wide receiver Xavier Moss. Josh Jenkins will be one of the cornerback spots (64 tackles, 4 tackles for loss, 8 pass breakups, and 4 interception) with Chris Carnegie at the other corner position (54 tackles, 1 tackle for loss, 7 pass breakups, 3 interceptions). Army will face Fordham (home), Connecticut (road), Wake Forest (home), and Eastern Michigan (road) to start the season. It gets tougher from there with Penn State (road), Duke (home), Bucknell (home), and Rice (road) in the next four games. Games against Air Force (road), Tulane (home), and Rutgers (home) all lead into the Army-Navy game on December 12 in Philadelphia. Army has lost 13 straight to Navy and even if that is the only game they win in 2015, they will a successful season. It does, however, look like it will be a 4 to 5 win season for Army. The FBS Independents are easy to sort out for 2015. Notre Dame is clearly the best team while BYU will have another solid season. Army is probably still a year away from being a bowl contender. Below is the predicted order of finish. Be sure to check out the Sun Belt preview and check back on Friday for the Big 12 preview.